You may not have thought much about a new toilet seat until the moment that you decided your home and bathroom needed a makeover. Whether you are remodeling or are building your home from scratch, you will find that it takes time to find the perfect materials and products for your home and that includes your toilet seats. You may be a choosy person who must have everything perfectly matching or you may care less about your toilet seats and whether or not they have “quick release” or “whisper close,” but this list may help you to see just how important choosing the right toilet seat is for you. Following is a comprehensive list of some of the best toilet seats on the market that will win you over with price, quality, and beauty. You may not have even realized how much you may actually need or want some of the features listed ahead, but once you’re through with our list of best toilet seats, we are confident that you will re-think the way that you look at this valuable commodity of everyday use. What do you think you would want to find in a toilet seat? While it seems to be an unnecessary question, the truth is that there is more than meets the eye when you are looking for a toilet seat. You may have thought that buying a toilet seat is as easy as walking into a store and picking out the cheapest one, but if you desire long-lasting and comfortable use, it behooves you to consider it a bit more. For example, think about a noisy toilet seat that slams down when you are trying to close it or slams down by accident when you are trying to keep it quiet during the night. The Mayfair Slow-Close Molded Wood Toilet Seat has a Whisper-Close hinge that allows you to close the lid softly and quietly and also helps your little ones to avoid pinched fingers. While this toilet seat has many top features that make it the gold winner, this feature is the one that makes everyone starry-eyed. Quiet, soft, and slow, the Whisper-Close hinge is what quiet bathroom visit dreams are made of. The Mayfair toilet seat also has a state-of-the-art clean and change hinge that allows you to get into areas that are typically difficult to reach with your sponge. We’ve all been there; you have a guest over or family visiting and you want to get your toilet clean before they come. You’re scrubbing, but you just can’t get that muck and mire that is stuck in the tiny little corner. You know what that’s about and it’s not a fun experience. With the Mayfair design your toilet seat can be squeaky clean at a moment’s notice, which we all know is a wonderful feeling. No one like to see a dirty toilet seat! Another great feature of the Mayfair Slow-Close Molded Wood Toilet Seat is the eco-friendly materials that it is made out of. Knowing that your toilet seat was made through an environmentally sound process may help you to rest easy when considering your purchase. Made out of primarily recycled wood, the Mayfair toilet seat is one that you can feel proud of having in your home and bathroom. While the Mayfair is by no means a fancy seat with intricate designs, the beautiful simplicity of it helps it to blend in with the rest of your bathroom and décor. Sleek and smooth, you can spend hours-if need be-on your toilet catching up on the latest newspaper or your favorite book. Another favorite feature of this toilet seat is how easy installation is. There is no need for fussing around with the easy to grasp bolts and nuts that do not require the use of pliers to install it tightly. 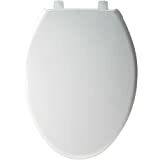 At $30.99, this functional and attractive toilet seat is an affordable addition to any home and bathroom remodeling. While you may want to consider the shape and size of your toilet before buying what many consider to be a rather elongated toilet seat, it is a top quality toilet seat that will offer excellent functionality for years to come. Attractive, convenient, and affordable, the Mayfair Slow-Close Molded Wood Toilet Seat deserves its place in the spot-light. Slamming toilet lids are what toilet seat nightmares are made of, especially in a multiple person household at night. Who wants to wake up their sleeping family after using the toilet? With the KOLHER Cachet toilet seat, quiet and bathroom use go hand and hand. The quiet-close grip that the KOLHER Cachet has is nothing short of wonderful. With this feature, you can be sure to close the toilet quietly and easily without that shocking sound of lid against seat. This is also handy for tired parents of children who tend to slam the seat regularly. If you are a mom or dad of a little one learning to use the bathroom, it also helps to protect them from slamming the lid down on their little fingers, which every parent knows is no fun. Also, if you are a parent, you know how much noise already goes on in your household and minimizing one of them will work wonders for your sanity. Although you may have to start nagging more about closing the lid, at least you won’t have to hear it slam! The KOLHER Cachet Quiet-Close Grip-Tight Elongated Seat is much like the gold medalist of our list in that it also provides easy cleaning. There is no need to be wrestling with this toilet seat to clean the misaiming of you, your spouse, or children; the Quick Release feature makes removing it a breeze. Let’s face it, there is little that requires as much cleaning and scrubbing as a toilet does. Besides a trash disposal or garbage can, there is not much else that sees so much waste on a daily and even hourly basis. One thing that people worry about when purchasing toilet seats is how long they will last. No one wants to have to think about those kinds of details on a regular basis, but unfortunately with so much use, many toilet seats tend to get scratched, break, or become stained. Not with the KOLHER Cachet, because with its solid polypropylene it remains resistant to scratches, peeling, and more. This feature alone makes it worth your money as toilet seats tend to see a lot of use throughout the years and having one that you won’t have to replace within months will save you time and money and keep your home looking high-end. Durability is a must in a toilet purchase and fortunately for anyone interested in buying the KOLHER Cachet, this is one positive feature that you will appreciate. While some people may be a bit thrown off by the elongated shape of the toilet seat, if you have a narrow elongated toilet and others may complain of how it doesn’t feel right the seat will fit perfectly and with a couple of days of use, you should get used to it. One feature that may be of interest to men is the way that there is a hand-hold at the front of the seat which makes it a quick lift up for a hurried pee-break. Guys know that this is a nice feature that makes the “lift and go” process much more efficient. Installation is simple and quick, but it can get annoying if you don’t install the toilet seat right from the beginning. Some people be confused by the lack of good instructions that come with the toilet seat, but as long as you take your time to make sure that everything is aligned correctly, you will have the toilet seat looking and feeling great in no time. All in all, this toilet seat offers class, comfort, and quality for your new bathroom. At $41.74, it is somewhat pricier than your average toilet seat, but the durability and functionality of the KOLHER Cachet Quiet-Close Grip-Tight make up for it. These components alone are what set the KOLHER apart from cheaper purchases and make it a perfect addition to a home where cleanliness and quietness matter. You can never pay too much for comfort. The Bemis Plastic Toilet Seat may not be as fancy as the silver and gold winners of our Best Toilet Seat list, but it definitely stands up to criticism with its great commercial design that stands up to tough use and heavy users. Typically, plastic toilet seats get a bad rep and with reason, when you think about those thin built ones that will only last a couple of months before they get cracked or broken. This beauty is not only more durable than its plastic competition, but it is also sturdier. With its easy to use seat fastening system, you can rest assured that your toilet seat will stay in place no matter what. 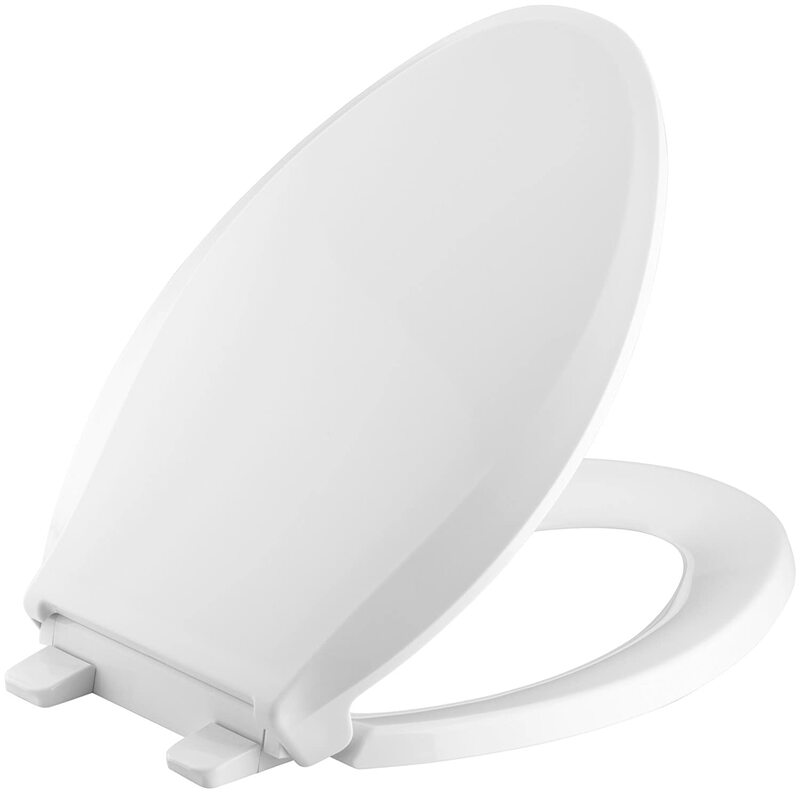 While its design is not fancy and it is a simple plastic seat, the quality that is found in the Bemis Plastic Toilet Seat is superior to many of your average plastic toilet seats. At $25.28, it is an affordable seat that looks good and feels right, especially when installed on elongated toilet designs. While you may question if 25 bucks is a fair price for a plastic toilet seat design, once you have it installed, you will see why it is worth that and even more. 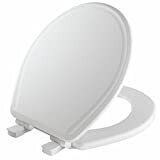 The support that the Bemis Plastic Toilet Seat provides is unmatched in that people who are of a bigger build will have no problem with the toilet seat moving or pinching or being too uncomfortable. This toilet seat is a heavy duty seat that was built to last and as everyone knows, you want a toilet seat that will last. It may not be something that everyone actually thinks about when purchasing a toilet seat, but for tall, strong build, or heavy people, you don’t want a toilet that feels like it will break at a moment’s notice. Because it is made out of plastic, it is even easier to clean than most wooden toilet seats, making it an attractive buy for people who want a clean toilet and bathroom, but who have little time to be scrubbing-a-dubbing for hours on end to remove stains. With wooden toilet seats, you may find that with time they start to look stained due to wood being more difficult to clean. Plastic is more receptive to cleaning substances, including bleach, which makes it ideal for your toilet seat use. This is just one of the features that make it a positive pick on our “Best Toilet Seat” list. One of the biggest things that makes it stand out from many other plastic toilet seats available on the market is the fact that it is a strong and durable toilet seat that will withstand plenty of weight. 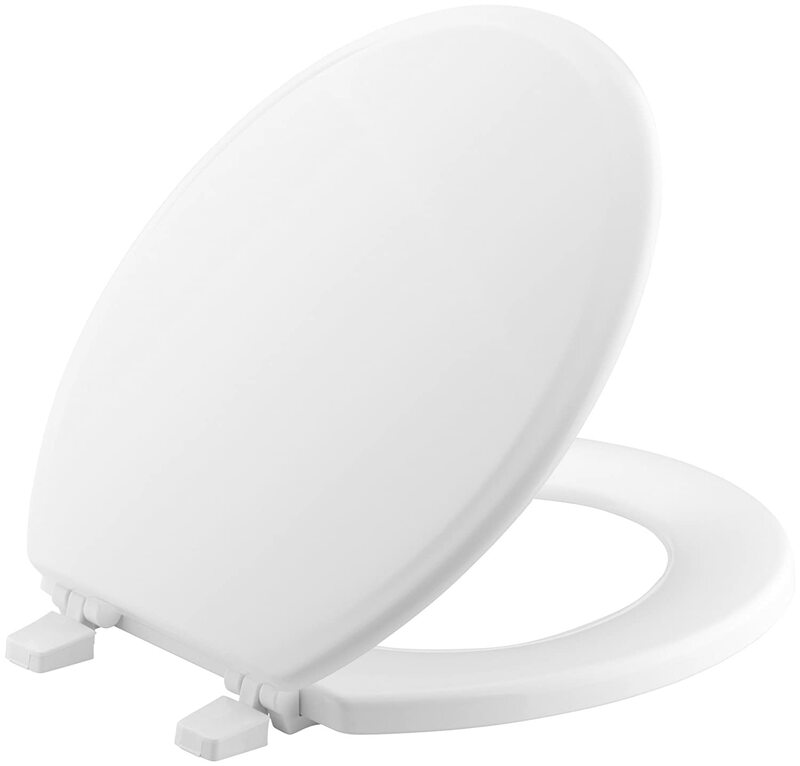 Forget those flimsy plastic seats that can break at a moment’s notice, the Bemis Plastic Toilet Seat is without a doubt “king” of plastic toilet seats. It’s not as pretty and as quiet as our first and second place winners on this list, but if lower prices and quality work for you, this is the pick for you. When you find yourself low on your bathroom remodeling budget, but you still have the toilet seat to buy, the KOHLER Ridgewood toilet seat may be your saving grace. It offers quality and class while remaining a highly affordable purchase for your home and bathroom spending. Anyone who has ever remodeled a home knows that it can be costly, so spending less on something great is always a fantastic experience. That is what the KOHLER Ridgewood toilet seat does for you! 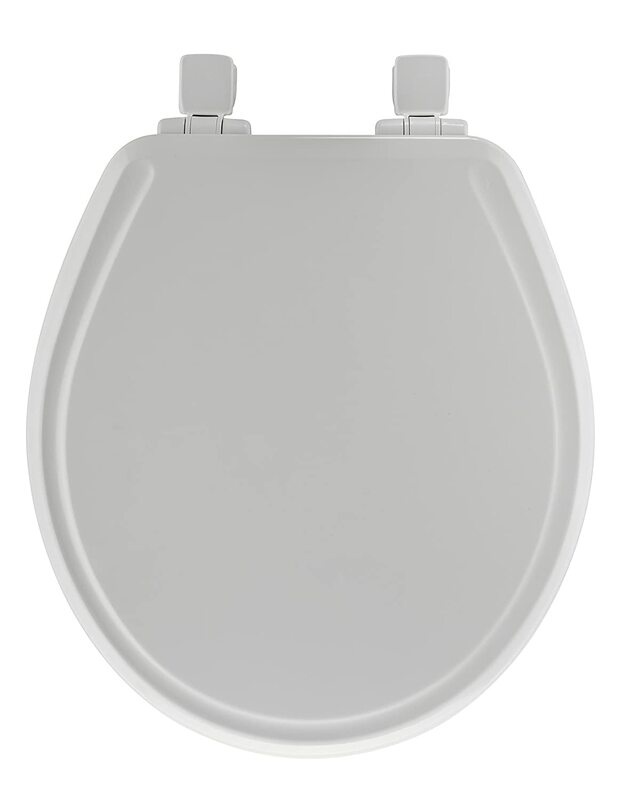 At only $13.03, you may wonder if this KOHLER Ridgewood toilet seat will actually stand up to frequent use. While it doesn’t have soft close features or the ability to change and remove it for cleaning, this toilet seat will provide you with what you really need out of a toilet seat: a comfortable place to set your buttocks when using the restroom. The KOHLER Ridgewood is durable, strong, and made out of quality compressed molded-wood which makes it a great purchase for such a low price. It’s a strong toilet seat which is surprising for the light-weight look and feel of it. The KOHLER Ridgewood is also very easy to clean, stays firm and supportive, and doesn’t shift even while being used by larger people. This beauty is a durable and long-lasting seat. The design has a rounded front which is a step away from the other toilet seats on our list that are mostly designed for elongated toilets. If you need an affordable, beautiful, and quality toilet seat for your rounded toilet in your home, the KOHLER Ridgewood Molded-Wood Round-Front Toilet Seat may be exactly what you want. At such a low price it is hard to go wrong with this buy. While this is a simple and straightforward seat without modern features that are important for some people, if you are all about functionality and a classic look, this is a great buy for a budget price. It isn’t fancy, but as a straight-forward and functional toilet seat, what more could you ask for, for under $15.00? Our list of Best Toilet Seat should help you determine which one is right for you. Whether you are tired of the slamming of toilets right and left and would love to sleep or live in peace without having to worry about that dreadful sound and want a toilet seat that closes softly or you desire to have a wooden toilet seat because you prefer them, our list gives you the options you are looking for. After reading through these reviews, you are most likely ready to think further about your toilet seat shopping and what you really want for your home and bathrooms. With these features and products in mind, you can now go about picking the one that is best for you. Choose wisely, your buttocks will thank you!